Posted on December 13, 2017 at 12:57 pm. This December, Power Spins Casino is giving players the chance to win a share of 6,830 free spins to use on some of the casino’s most popular online slot games, and all you need to do to be in the running is play your favourite Power Spins casino games for real money. 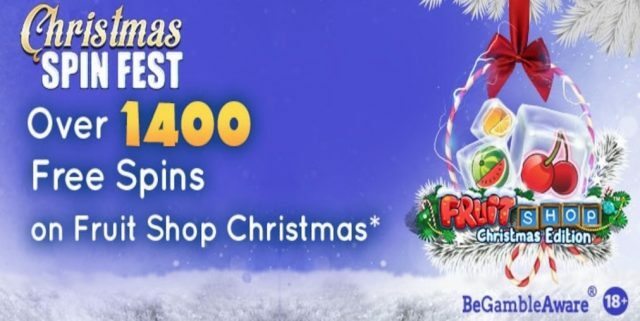 For every £10 cash wager you place between 1 December 2017 and 1 January 2018, you will earn one ticket into the weekly free spins prize draw. To increase your chances of winning, you can also play the Power Spins game of the Week to earn two tickets for every £10 wagered. There is no limit to the amount of entries you can have, so the more you play the higher your chances of winning, but you will only be eligible for one prize each week. As part of Power Spins “Free Spins, No Strings” policy, no wagering requirements apply to these free spins. Free spins will be credited the following business day, but come with a three day expiry. If you’re new to Power Spins, signing up for an account and depositing at least £10 will also see you being rewarded with one free spin for every £1 deposited, for up to 50 free spins altogether. These free spins can be used on Starburst, Aloha! Cluster Pays, Pyramid: Quest for Immortality, and Joker Pro. No wagering requirements apply, but be aware that deposits made using Neteller or Skrill will not quality for the free spins. We strongly suggest reading the bonus terms and conditions at PowerSpins.com to make sure you understand the fine print of any bonus offer before you make a deposit. To learn more about what this vibrant online casino has to offer, read our detailed Power Spins Casino review here. 2006 - 2017 TopOnlineCasinoSites.com. All rights reserved 18+ Gamble responsibly.